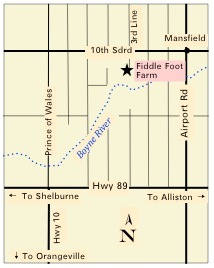 We are located North of Hwy 89 and west of Airport Road, about 5 km west of the town of Mansfield. Turn west on County Rd 17 (10th Sideroad). You will pass the 5th and 4th Lines, we are on the 3rd Line. Turn left (south) on the 3rd Line (you’ll see that it’s a NO EXIT). Head north on Hwy 10 to Hwy 89. Keep going north, the road will now be called Dufferin County Rd #19 or Prince of Wales. Take that north until you get to the 10th Sideroad (also marked sometimes as County Road 17). Turn right (east) past Centre Line, 1st and 2nd and we’re on the 3rd Line. Turn right (south) on the 3rd Line (you’ll see that it’s a NO EXIT).